Spiders have a seemingly impossible range of locomotion: they walk, run, jump, balloon, swim and, as found in a species discovered in 2009, even tumble. Some spiders employ more than one of these methods of locomotion, while others are known for a specific type. Unlike humans, spiders walk, run and move by use of hydraulics, just like many man-made machines. This means pressurized liquids generate, control and transmit power. In the case of spiders, pressurized liquid is stored in the cephalothorax, the body part the legs are attached to. When the spider pushes one or more legs down, the liquid is forced into another pair of legs. Spiders have the ability to quickly increase and decrease body pressure to power their legs. Walking and running are among the most common forms of locomotion in all terrestrial creatures. When walking and running, spiders alternate their four pairs of legs. While two pairs of legs are in the air, the other two pairs are on the ground for support. At the ends of the spiders' legs are many special hairs that have microscopic feet that allow them to grip onto horizontal and vertical surfaces. 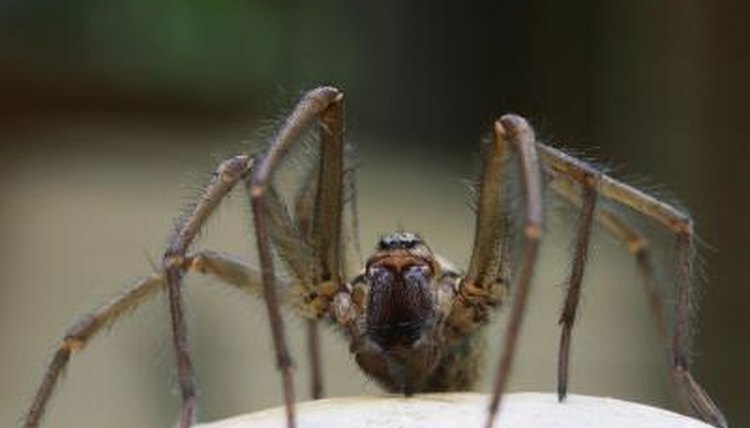 According to Cornell University's Naturalist Outreach, the fastest spider, the giant house spider, can run about 1 3/4 feet—approximately 34 times its body length—every second. Not all spiders jump, but some are known for it. Nearly 4,000 species belong to the jumping spider family (Salticidae). These spiders are typically on the small side and vary greatly in appearance, but their namesake is their jumping ability. Jumping spiders generate eight times their resting pressure for a jump. Some of these spiders can jump up to 25 times their body length by building up pressure in their third and fourth pairs of legs. It's not uncommon to see a hunting jumping spider make small hops prior to leaping onto its unsuspecting prey. Fishing spiders belong to the family Pisauridae and are so called because they float on the water's surface and row with their legs. These large but lightweight spiders have additional hairs on their special feet that allow them to evenly distribute their weight on the water's surface. They row with their second and third leg pairs. Some spiders, particularly very small immature spiderlings, move by a method known as ballooning. They send out a strand of silk that gets caught and blown by the wind, sometimes taking the spiders many miles away. The most recently discovered form of locomotion among spiders is used by the hand-springing spider, which lives in the Sahara Desert. This large white spider, about the size of an adult's palm, travels by tumbling like a tumbleweed at the blinding speed of 6 1/2 feet per second. Two other species are known to roll in a similar fashion, but only to go downhill.